The guest speaker at the September meeting was Mark Mitchels, who returned to Diss U3A to give a talk on ‘The Lost City of Dunwich’. The next meeting of Diss U3A will be on Thursday 2nd October, commencing at 10.30, at Diss United Reform Church. The guest speaker at the October meeting will be Elizabeth Gowing who will give a talk called ‘Edith and I – On the trail of an Edwardian Traveller in Kosovo’. 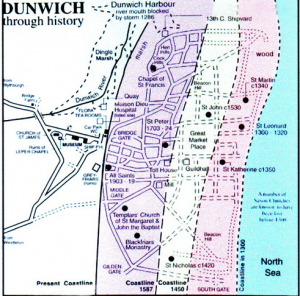 In a fascinating recount of the rise and fall of Dunwich as a prime seaport, Mark Mitchels described the size and influence of this city, using photographs and maps. 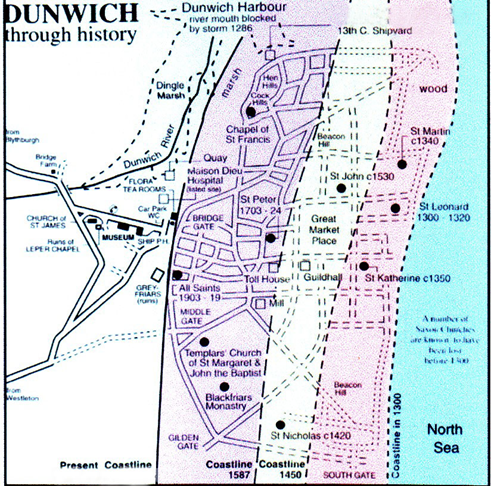 We learned that Dunwich was used by the Romans as a port. By 500 AD a shingle spit began moving southwards towards Dunwich, giving birth to the large Dunwich harbour. Later, Anglo-Saxons and Vikings used the area for trade and defence, recognizing its anchorage potential. The population of around 3000 was greater than Norwich or Ipswich, thus enticing the Normans to build on the city’s power as seaport. A parish boundary was drawn to the west to take in all the anchorage area and exclude the farming communities to the west. This was possibly their greatest mistake, as the city might have survived what was to follow, had its inhabitants not so arrogantly alienated their neighbours. By 1225 there were probably 5000 people living in the city and many churches. Henry VIII kept two royal ships in the harbour whilst Richard and Alice FitzJohn built Greyfriars monastery. Dunwich flourished. People flocked to the central market to buy herring, wool and other imported luxuries. However, on 23rd March 1226, a huge storm flooded the town, destroying all its sea defences. Greyfriars was abandoned and the storm blocked the harbour entrance (whilst unblocking the northern entrance at Walberswick.) It took 3 years for the residents to unblock their harbour and re-block the northern entrance! 200 houses were lost in this storm. There is evidence of piracy in the port – 10 men were hanged in Ipswich. Bad luck was followed by worse luck – another huge storm (1300) affecting half the city. The harbour entrance closed up at least twice a year so traders, unsurprisingly, shifted their allegiance to Ipswich. In 1328 another storm completely blocked the harbour entrance and the area (now known as Dingle Marshes) subsequently ‘gunged up’. The town gradually declined as over 400 more houses collapsed into the sea. The population dwindled to 600 whilst Edward III deprived Dunwich of its right to have a city mayor. The city was doomed…. In 1570, chronicles recount how another massive storm left Dunwich residents in ‘utter dismay’. By 1677 the water had flooded over the market place. By 1702 St Peter’s church had been stripped of its lead before it tumbled over the cliff. By 1755, All Saints was the only surviving church. Dunwich was now a tiny fishing hamlet. Smuggling along the beach enticed poets and artists (such as J M Turner to flock to Dunwich and feed their imaginations on the lost city. In 1830 St James’s Church was built beside the leper hospital. Ironically, the hospital remains survive as it had been deliberately built on the western outskirts of the once flourishing city. 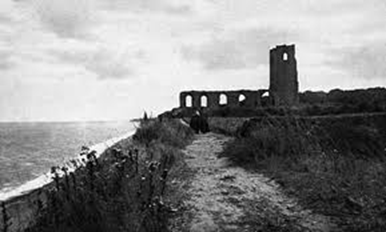 In 1919 the tower or All Saints Church collapsed in to the sea. The remains of Dunwich are what we can see today, including a sprinkling of Edwardian and Victorian houses and a small, fascinating museum which shows the trail of decline and destruction in this once prestigious city. The popular fish and chip café has been a recent, welcome addition.